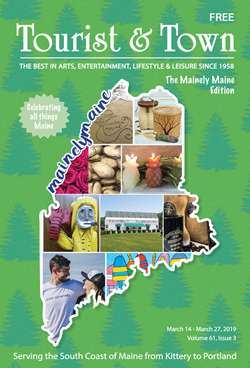 Whether you live in southern Maine year-round, spend part of the year here in your seasonal home, vacation in the region regularly or are about to make your first visit, Tourist & Town is your indispensable guide to places to visit and things to do. 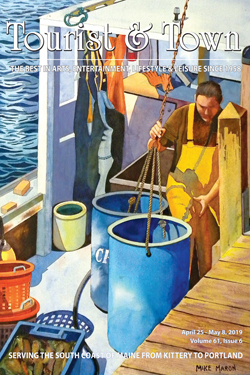 The coastal communities of Kittery, York, Ogunquit, Wells, Kennebunk, Kennebunkport, Cape Porpoise, Goose Rocks, Biddeford Pool, Biddeford, Saco and Old Orchard Beach are covered in this lively arts and entertainment newspaper, as are the inland towns of the Berwicks, Eliot, Lyman, Alfred and Sanford and other small towns that comprise rural York County. Like the newspaper, touristandtown.com will tell you everything you need to know to enjoy all that this part of the Pine Tree State has to offer. Maine’s south coastal region is Vacationland at its best. There are nearly 20 miles of coastal beach, dozens of navigable lakes, ponds and rivers, many miles of trails for hiking and biking, wildlife preserves, hundreds of historic sites and buildings, museums, art colonies and arts organizations. Southern Maine is a golfer’s paradise with more than a dozen public or semi-private courses, several private ones, a driving range and numerous mini-golf courses. An amusement park in Old Orchard Beach dates back to 1902 and there are water parks and an amusement park in Saco. There are numerous opportunitities for visitors to go surf fishing or deep-sea fishing, take a scenic boat ride or join a cruise to see whales, seals and lighthouses. There are three summer playhouses and a year-round theater, moviehouses, two state parks, four lighthouses and numerous offshore islands for exploring, picnicking and camping. We even have our own National Estuarine Research Reserve – the Wells Reserve at Laudholm Farm in Wells. Visitors to the area can choose from every conceivable type of accommodations – grand old hotels, contemporary inns and hotels, roadside motels, small inns, bed and breakfasts, private rental cottages, new cottage colonies, campgrounds and RV communities. Dining venues abound from informal family fare to fine dining with an ocean view. 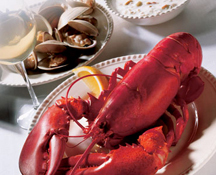 Maine lobster is on the menu almost everywhere, from the basics – boiled lobster with melted butter, lobster stew and lobster rolls – to the more exotic – lobster omelettes and lobster ravioli. Other popular fresh seafood includes clams, scallops and haddock. There are steakhouses, too, and numerous ethnic restaurants. Local restaurants pride themselves on using fresh, native produce, and Maine’s seasonal fruits – strawberries, blueberries and apples – are featured on menu listings from appetizers to desserts. Founded in 1958,Tourist & Town (formerly Tourist News) has had five owners. 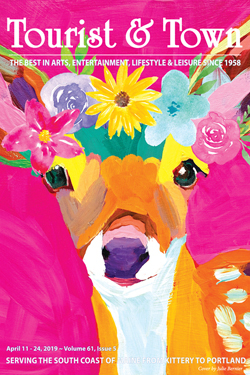 The current owner, Kingsley Gallup, purchased the newspaper in 2018; she operates the business from a home office in Kennebunk.Tourist & Town is an independent publication and is not affiliated with any other newspaper or media group. Tourist & Town is dedicated to keeping print and online readers informed and to supporting area businesses and organizations and the tourism industry. We promote every community activity from theater classes to church suppers, craft fairs to art exhibits, horse shows to road races. We tell the stories of the people who live, work and visit here. We capture the essence of this unique part of the world that has attracted visitors for 200 years. • Download our 2019 PDF MEDIA KIT with ad rates, ad and calendar deadlines and specifications.